Tunisia declares state of emergency after Sousse beach attack, grants extra powers to security forces. Mourners place flowers on the beach next to the Imperial Marhaba Hotel in Sousse, Tunisia, where 38 people were killed on June 26. 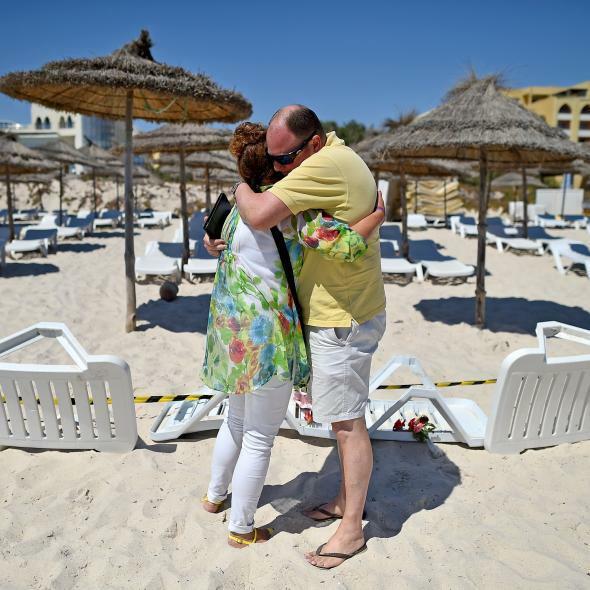 Original post, 1:28 p.m.: The office of Tunisia’s president, Beji Caid Essebsi, declared a state of emergency in the country on Saturday, eight days after a shocking attack on a beach and hotel in the resort town of Sousse that killed 38 people, most of them British tourists. Authorities also announced this week that eight people were arrested on suspicion of cooperating with the 28-year-old assailant, Seifeddine Rezgui, who was killed by police. The June 26 beach shooting was the second such rampage in three months, after another jihadist attack at the National Bardo Museum in Tunis on March 18 that killed 21 tourists and a policeman. The government response will reportedly include a crackdown on militant recruiters working through houses of worship, with authories vowing to close 80 mosques that are “operating illegally or preaching extremist messages,” according to Reuters.